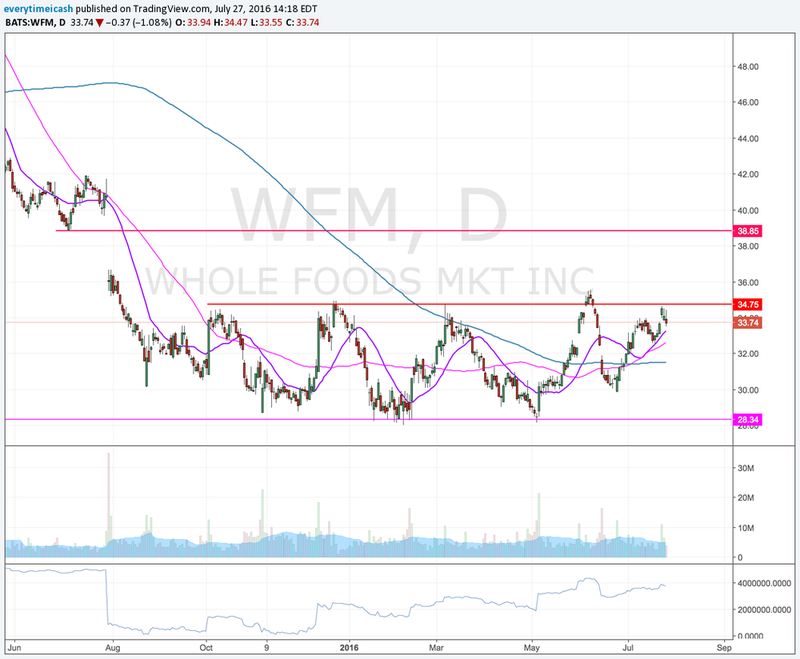 Whole Foods (WFM) is scheduled to report Q3 earnings after the bell today. Co reported last quarter's earnings at 4:05 p.m. ET (and a conference call is scheduled for 5 PM ET). Capital IQ consensus calls for Q3 adj. EPS of $0.37 on revs +3% to $3.72 bln. Last quarter, WFM beat on EPS and missed on revs. Shares gapped up ~1% after the report, and it eventually closed up ~6% at 30.21. Shares then went on a ~24.5% rally to hit highs of 35.58 on June 8. Shares sold off ~16% from these highs to touch a low of 29.88 on June 24. On June 1, Credit Suisse upgraded to Outperform from Neutral. Investors will keep an eye out on individual growth and on the impacts that the food distribution health concerns may have caused. Look for color on the quarter about the overall consumer.